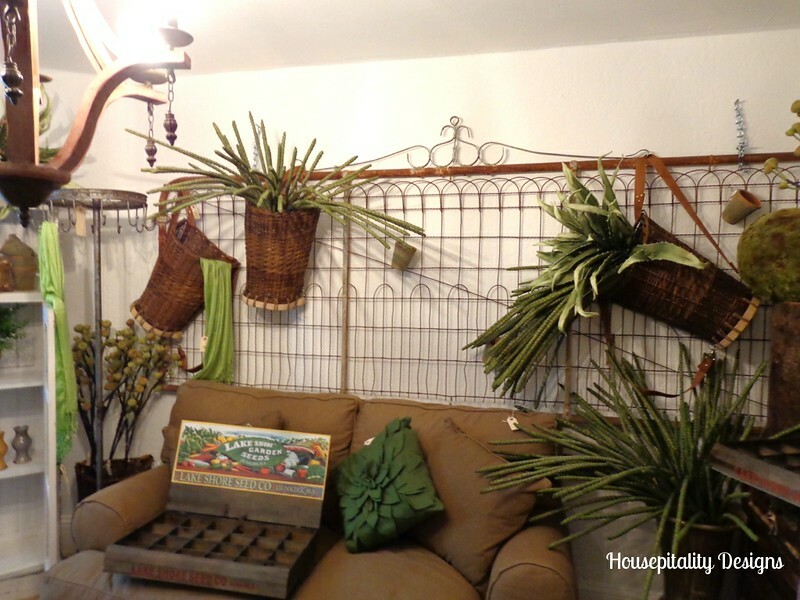 …..I stated that other than the wonderful antiquing, I so enjoyed meeting fellow bloggers…socializing. 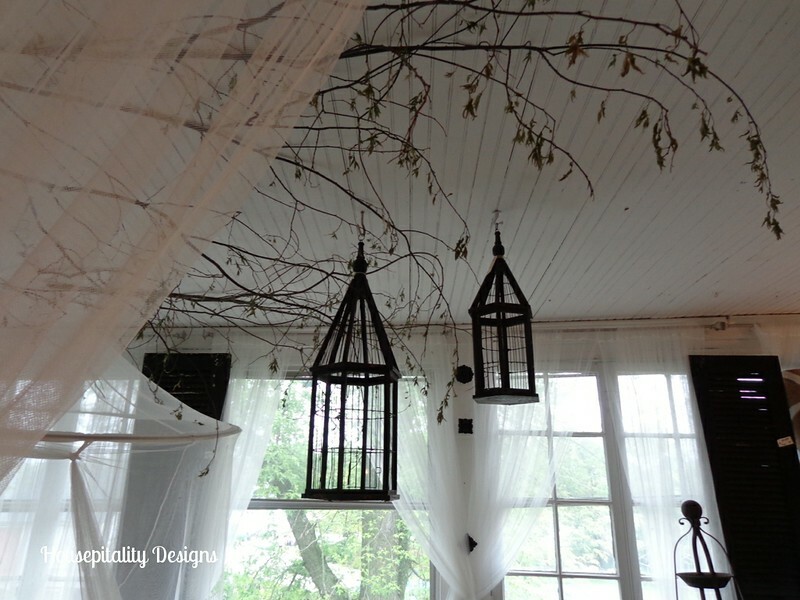 It is gorgeous…such a great group of talented people have decorated the Design House impeccably. So armed with my “point and shoot” camera (did not bring the heavy DSLR with me) and proceeded to “the house”. 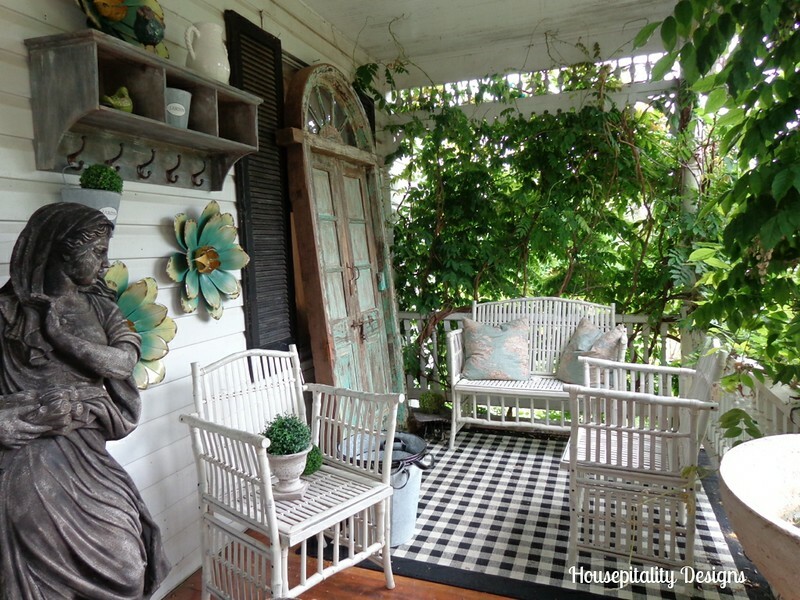 This area just makes you want to sit and have a glass of Sweet Tea! Each room was unique..Great numbered and lettered chests.. 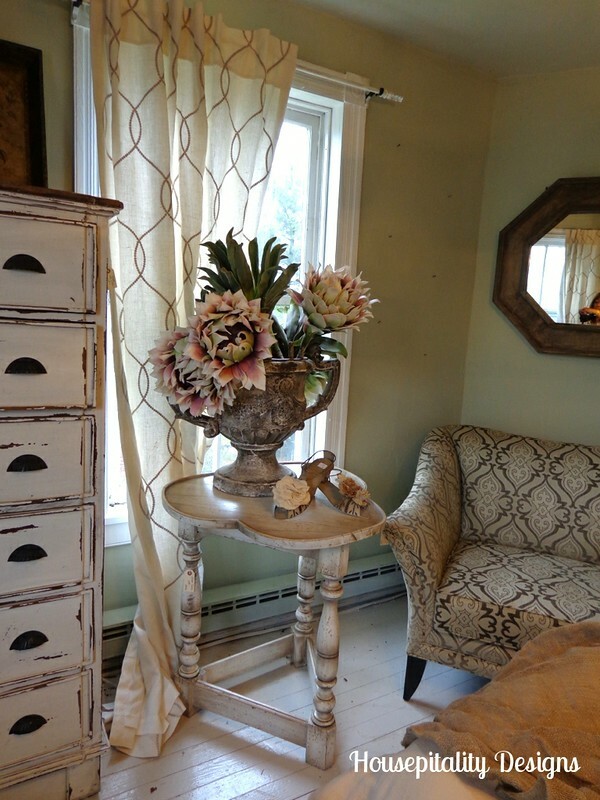 The dining room was located just off the foyer…beautiful! 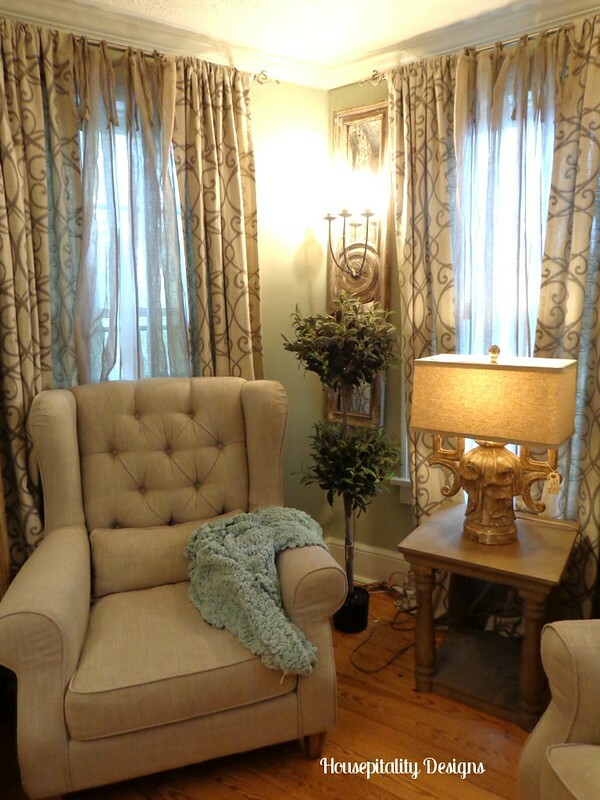 …..and if you noticed, the same carpet that was on the porch is in the dining room. 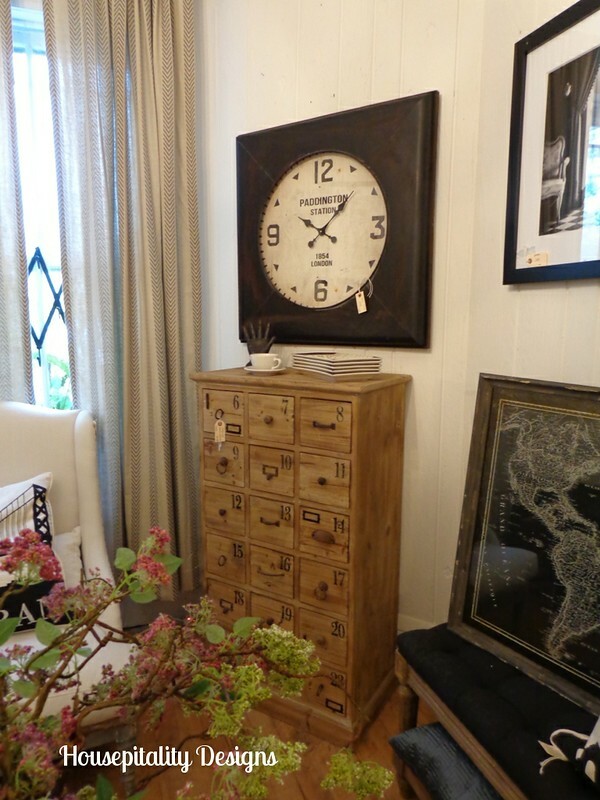 So many great accessories displayed beautifully for sale in the house.. 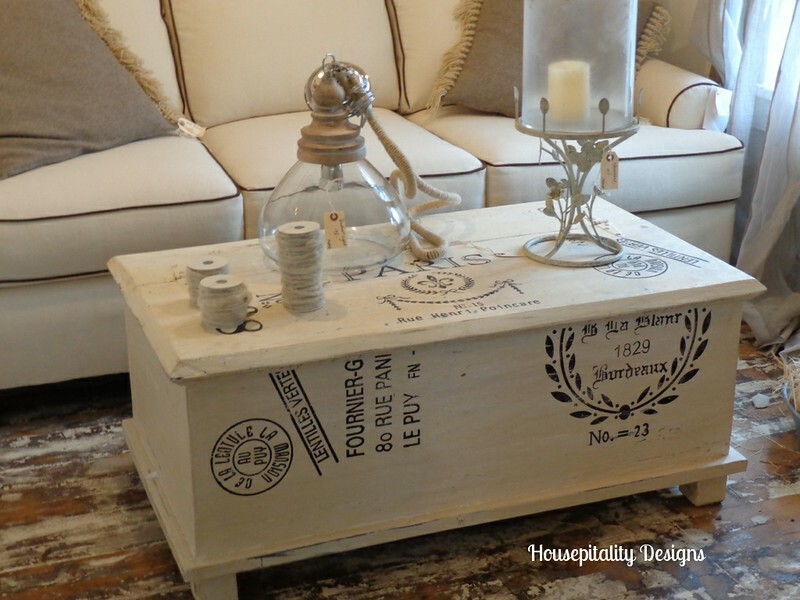 This chest is so wonderful and I know that many of you talented people out there could easily duplicate it!! There were so many nooks and crannies filled with unique accessories. 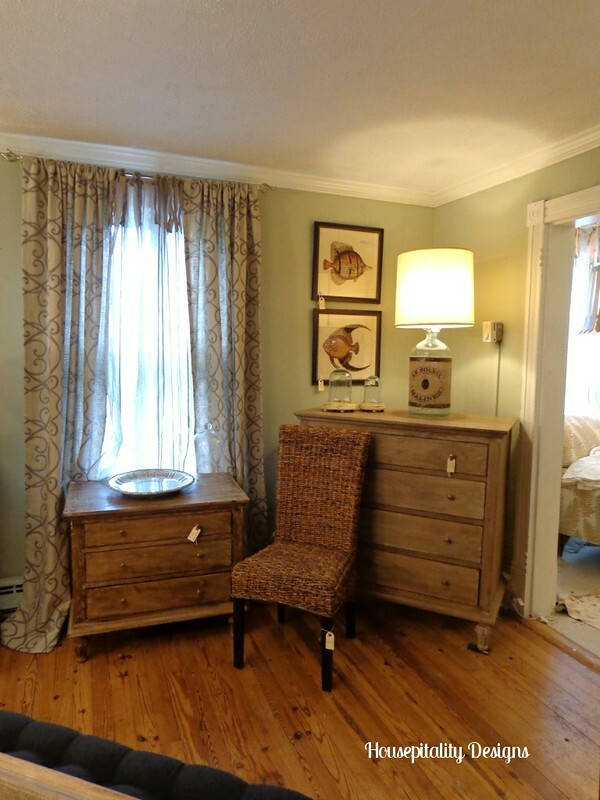 …..such creative furniture placement in this room. 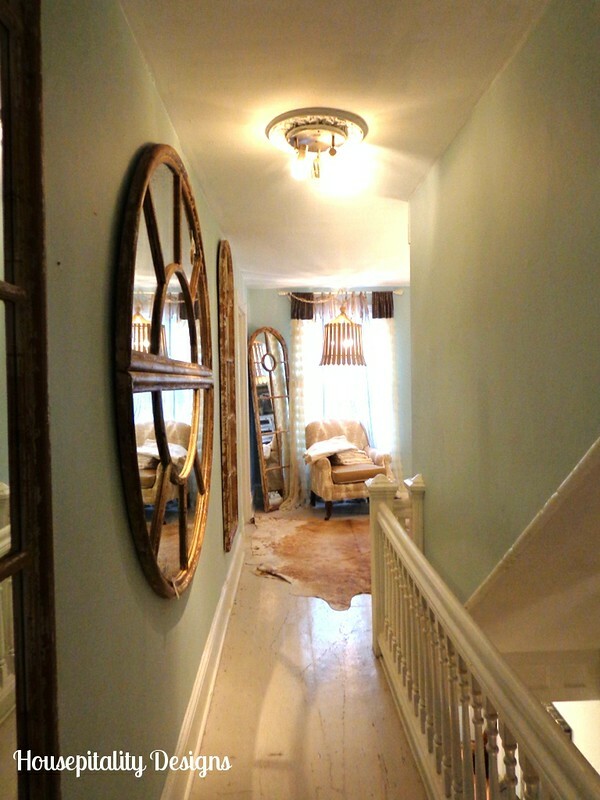 A view down the hallway of the upper floor…a pretty sitting area at the end of the hall. 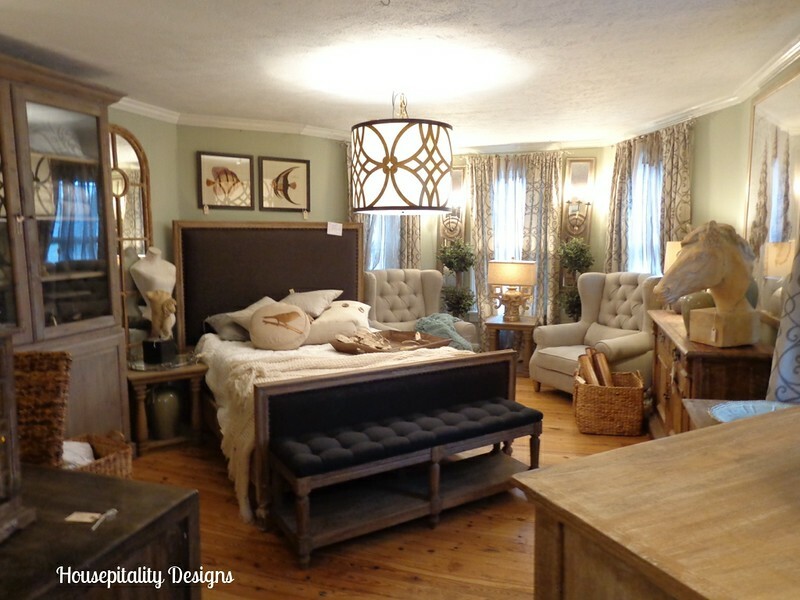 The furniture finishes were so fantastic…and I love how the light reflected on the ceiling. 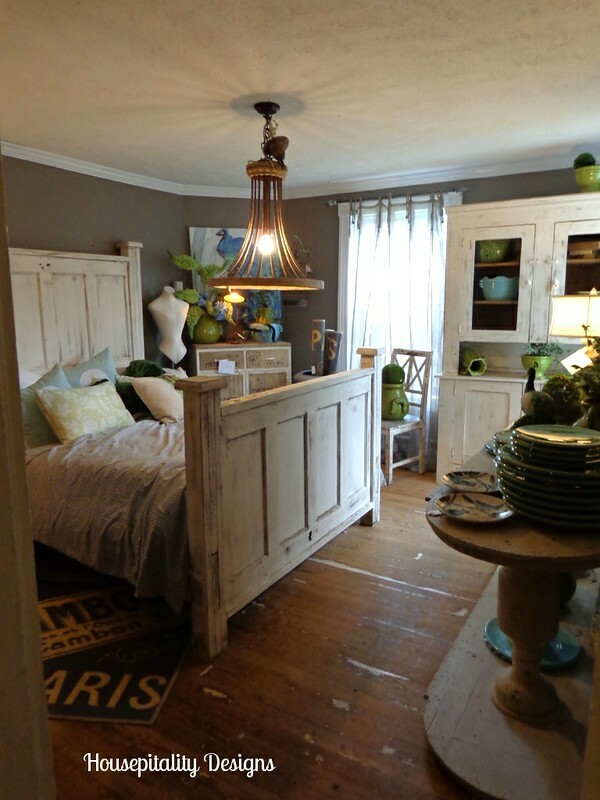 Even though I love the styling of this bed, in my mind, I was straightening the bedding and pillows! 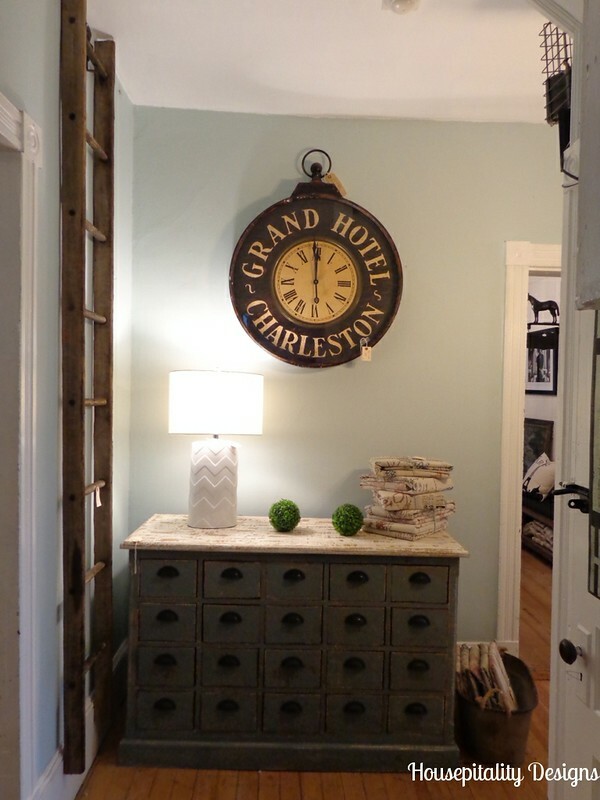 This chest was situated in the foyer toward the kitchen…I love that clock as it has “Charleston” on the face! 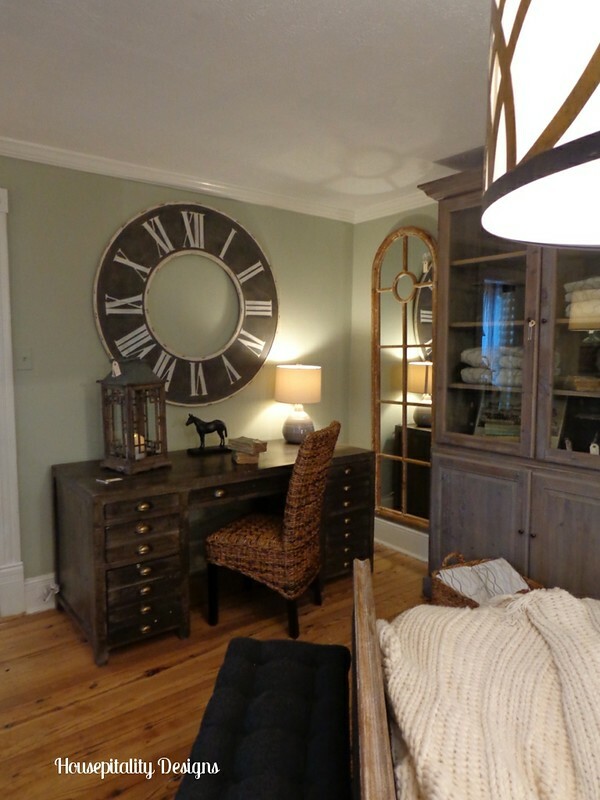 The room appeared to be designed as a staging area/work room. 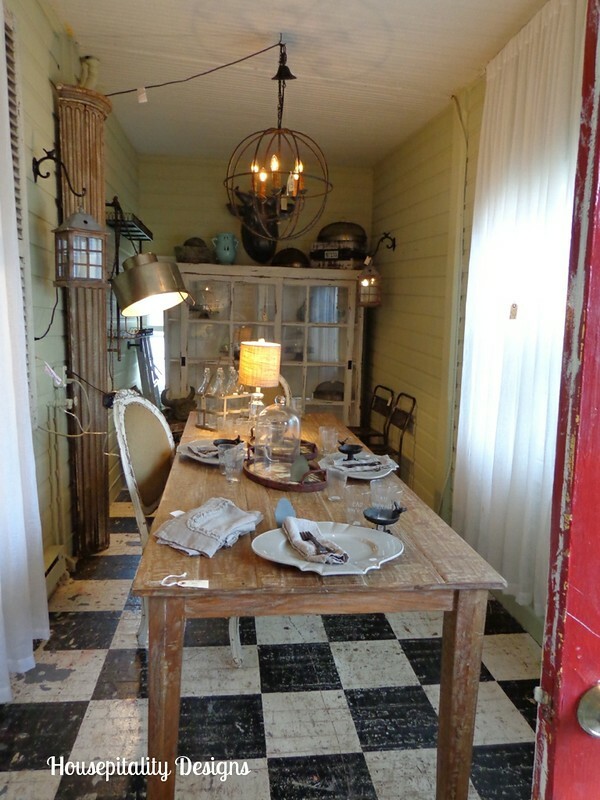 As we exited the Design House, you go through an enclosed back porch area that was such a delight to see. 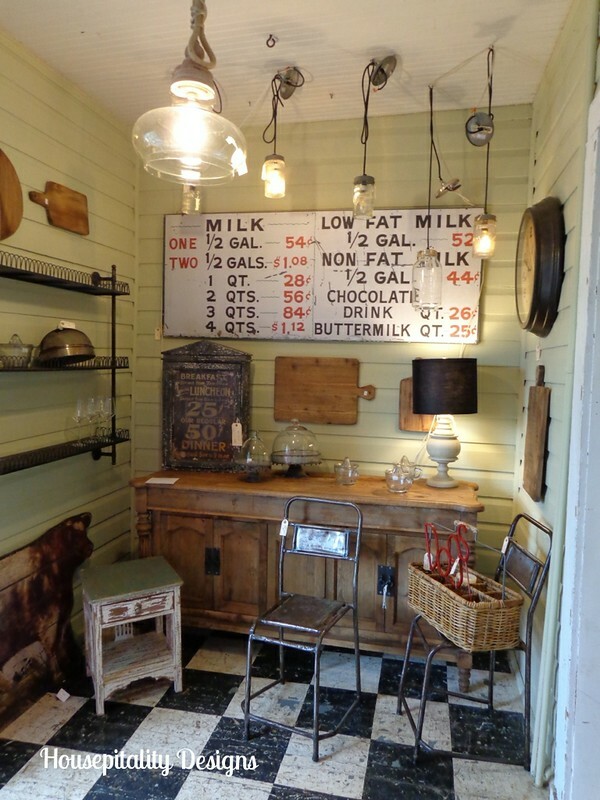 …..and it was hard not taking that dairy price sign home with me! 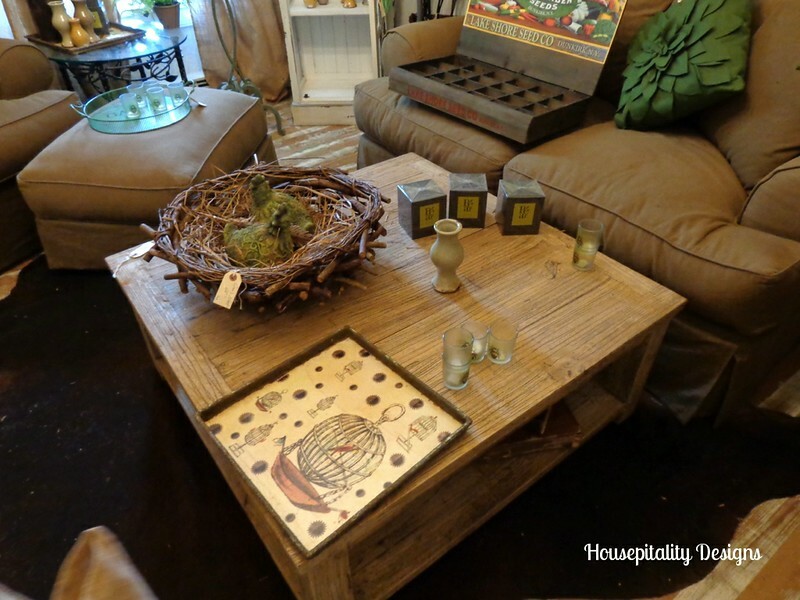 As you can see the table was sold..as so many of the items in the Design House. Well, it was time to leave this house….and too bad the clock was wrong, for if it was truly 10 after 10ish…. 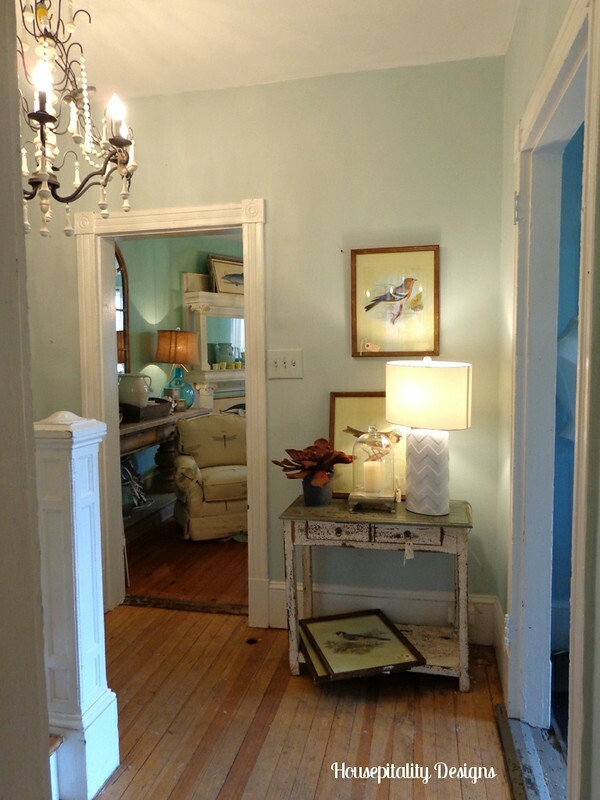 …..I would have gone out the door and back through the front to tour the house again. …..for it was totally worth it!!.. Next year…I will be there for the entire two days!!! 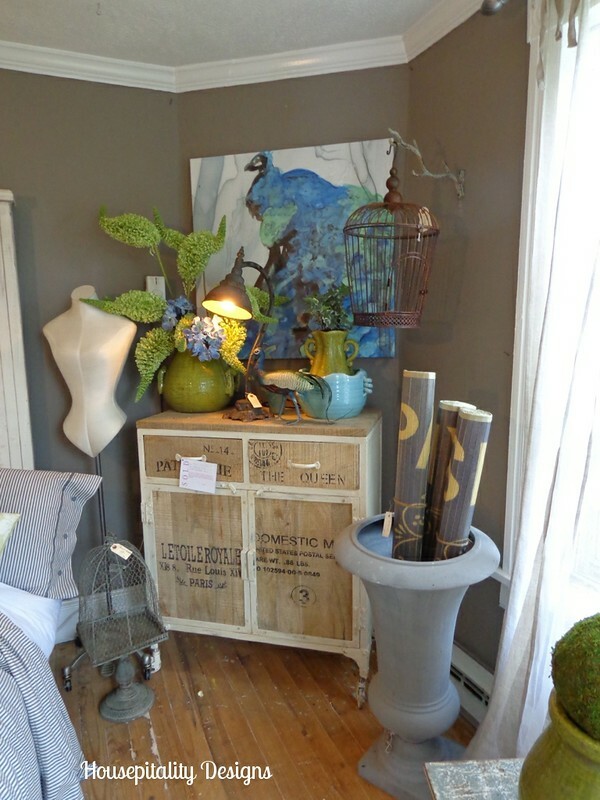 Hope you enjoyed the Design House as much as I did! ..and I will be there with you! 🙂 So much eye candy all in one place. Thanks for sharing your pictures and your tour with us. That house is amazing! 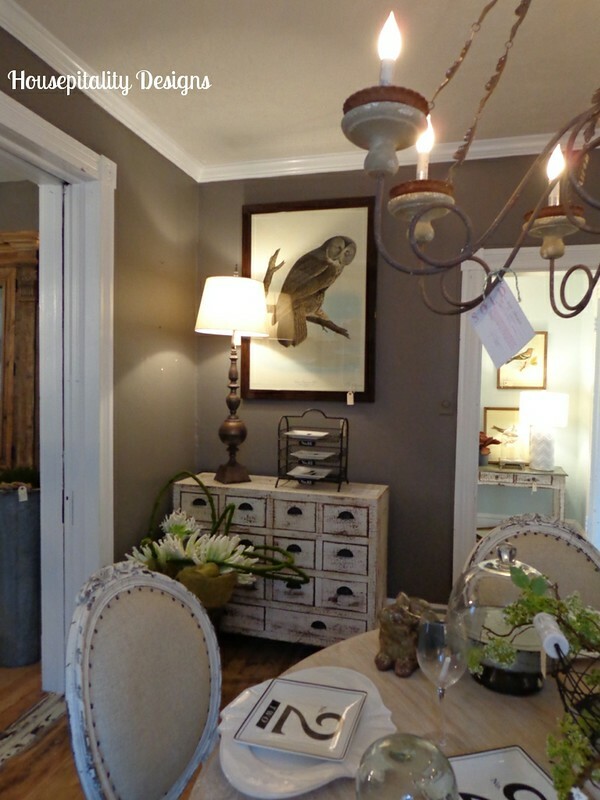 What a treat to be able to tour the Design House, lots of gorgeous items, just full of eye-candy! I’m going to have to scroll through the photos again and again just to make sure that I didn’t miss anything. 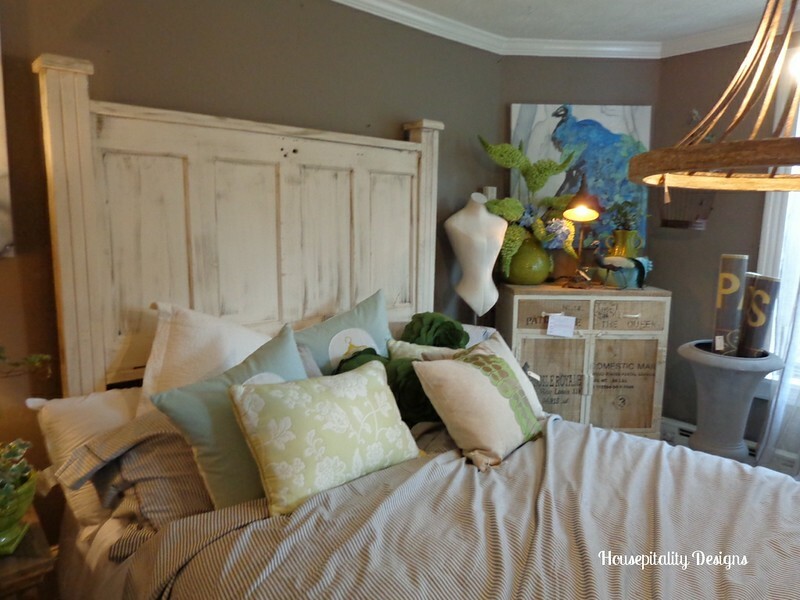 Oh, my, I love almost everything- I’m ready to move in! 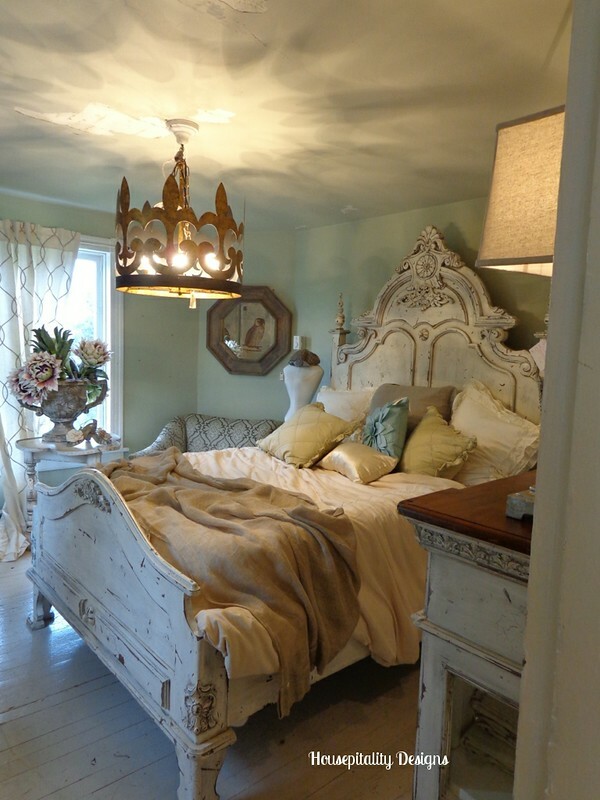 The carved bed is especially stunning. 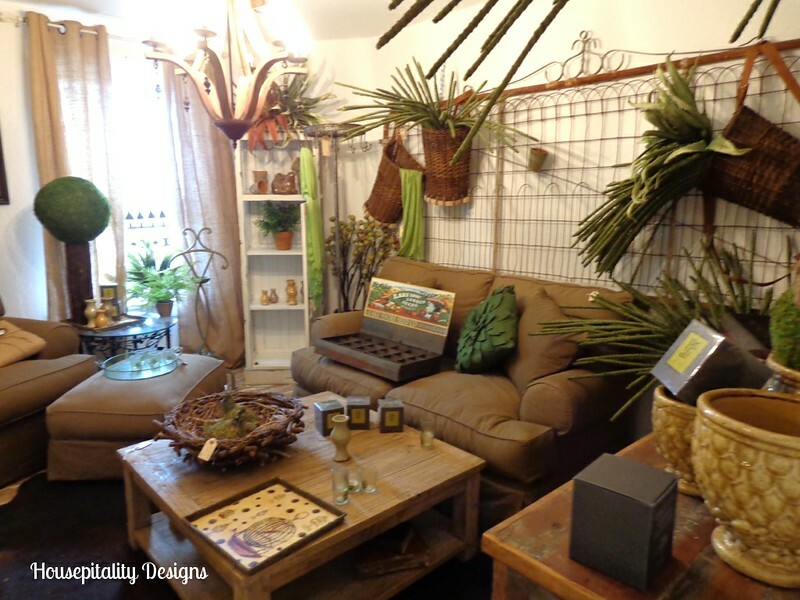 Oh Shirley, Thanks for sharing the Design House with us! I can’t wait to see it in person next year. 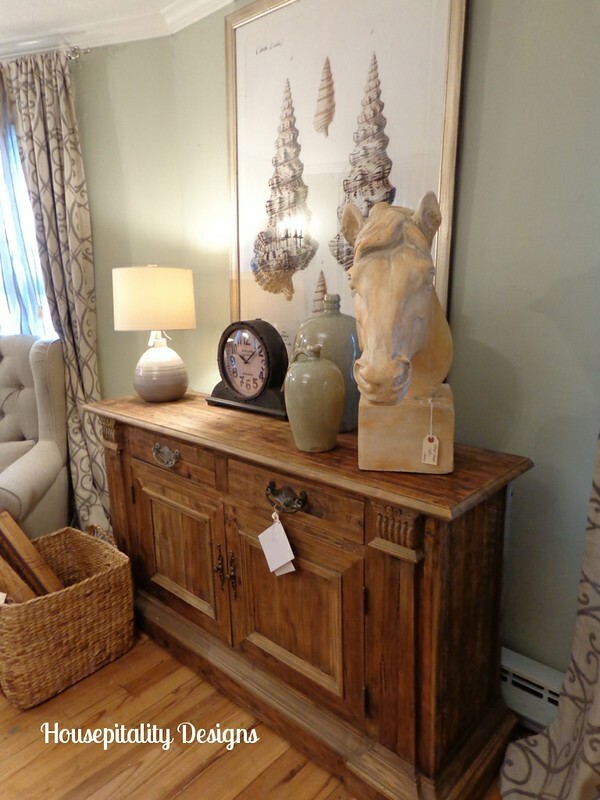 What beautiful items and so many it’s hard to chose a favorite or even two. great photos! so many wonderful ideas, you could spend the day in the house! 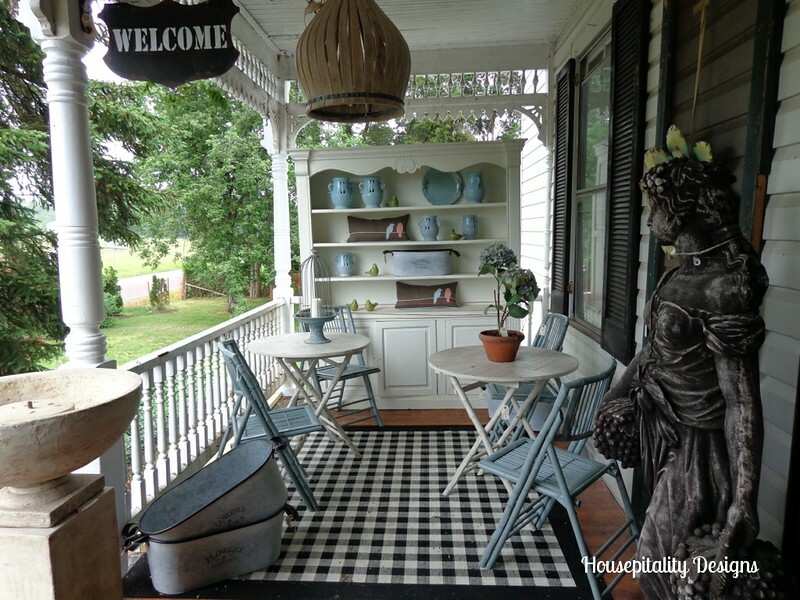 My favorite space is the front porch! Really sweet! I’ll bet you had a blast! Shirley thank you so much for sharing this home with us!! 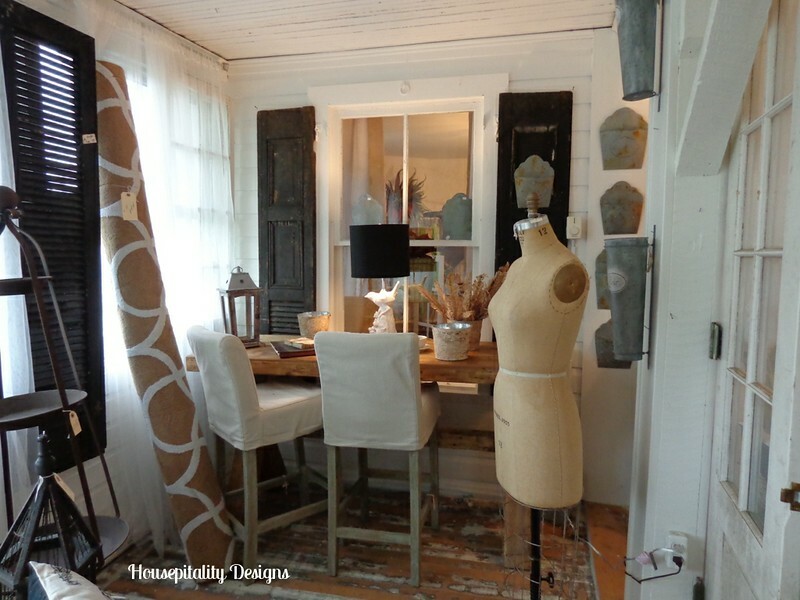 I love to tour design houses; you get so many wonderful ideas! 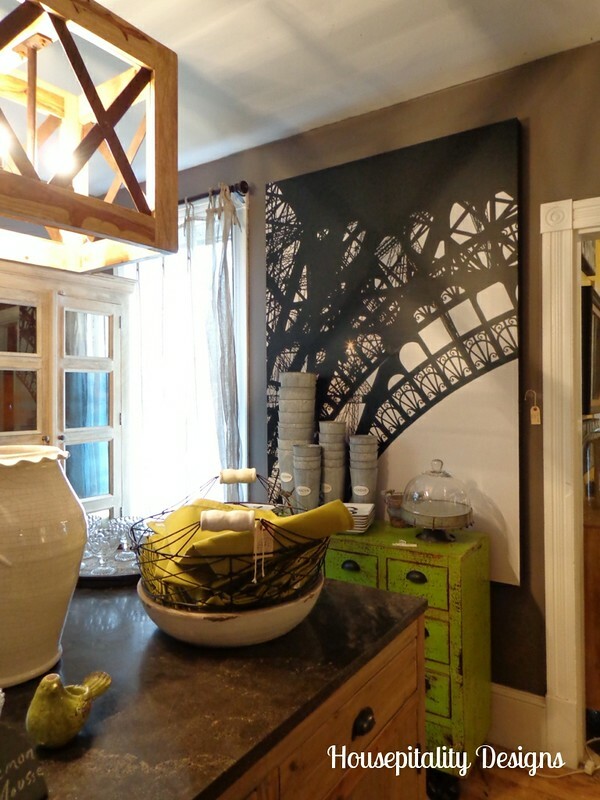 Karen Albert’s recent post…All Things French and Paris Oh Yes! OMG, so many great things. I want that grocery sign!! I saw the same huge cow head at QOH and it was over $400. Shirley, your photos are great! Thanks for taking us a long on a tour with you! 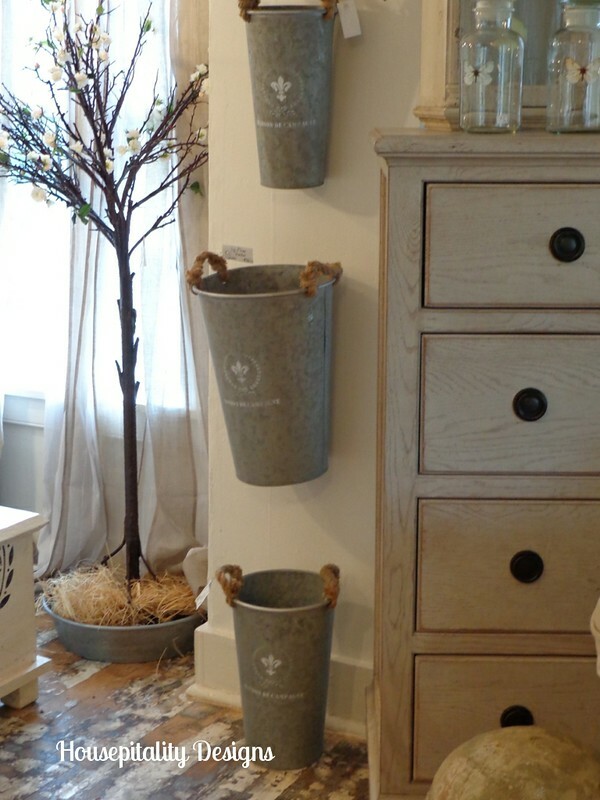 This is stunning and I love seeing all the wonderful ideas! Thanks for sharing! Shirley, can I just say WOW!!! That door on the porch is stunning, I would love that for my new house. The dining room is gorgeous with that rug. 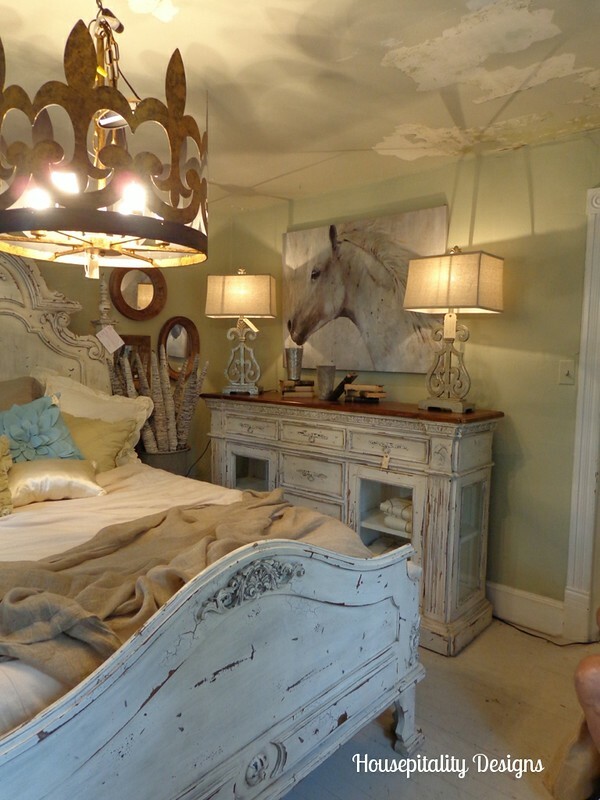 When I saw the bedroom, my jaw dropped from that bed and the chandelier. This was FANTASTIC tour to take us on. Loved it!! 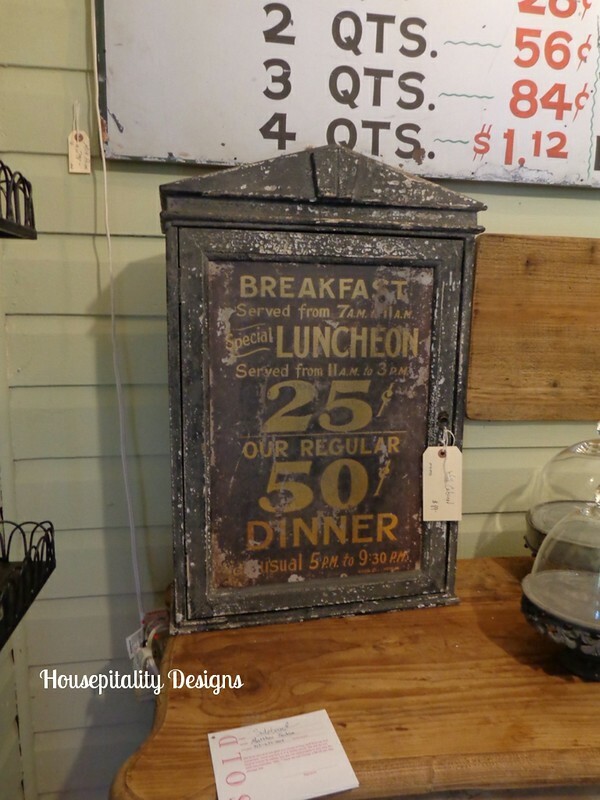 Thanks for bringing a little bit of Luckett’s to those of us that live too far away to attend…love the french postmark chest and I agree with you that it’s a piece that is sure to get duplicated in blogland…I also love the dairy sign – I think that’s on my list to recreate as is the restaurant cabinet…Thanks so much for the inspiration! How gorgeous, Shirley! Thanks for sharing your pictures. I would have enjoyed walking through there. I think it’s great that it looks like everything was for sale, too. OMG! Lucky you to get to go to that in person. I’ve only ever been able to see it online and didn’t get a full feel for it like your pictures convey. What a great place to shop! I saw quite a few things that sparked my interest. The light fixtures alone were fantastic! I love unique lighting. What fun! I would have enjoyed this,Shirley. I am loving the black and white/cream checked rug. Wish I had one for the back porch. 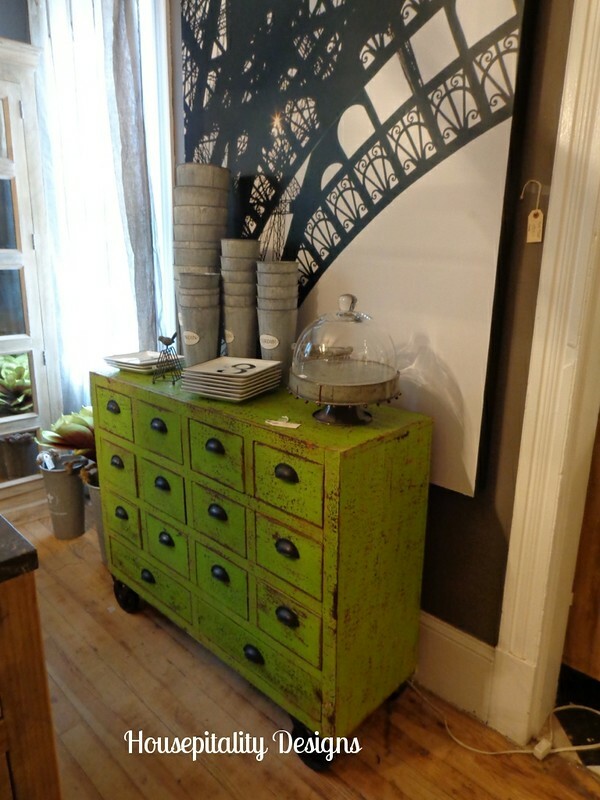 Love most of the furniture, I would have bought that buffet and the card catalogue in a heartbeat!! Pretty house, too. What great photos, Shirley. So many details to discover. Looks like you had a great time. Kim Hites’s recent post…I’m Back From France! Great photos! I enjoyed the tour since we had to be out of town for the weekend. No wonder you liked this place so much. It is filled with wonderful vignettes! That was a great tour. So many great pieces displayed so well. I would love to go to that show! We went last year and had a wonderful time! Thanks for sharing your photos!! 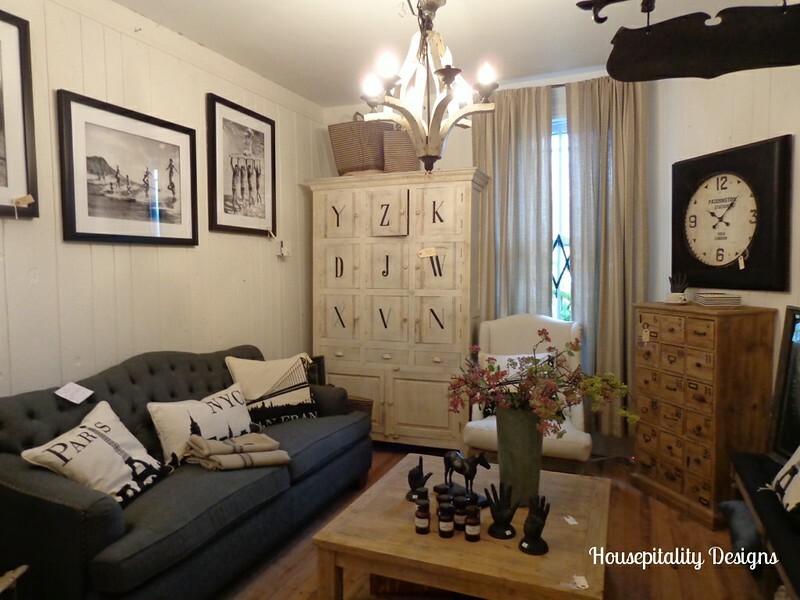 Love the design house tour Shirley, they are always such a great source of inspiration! The dairy sign, the checkerboard floor, the garden room… I had to chuckle at you straightening the pillows 🙂 Have a great Memorial Day weekend! Shirley, Thanks for all the pictures as it is the only way I get to see all the things you get to see. Maybe next year I’ll get to go. I loved everything! I would have been corralling people and herding them out of MY HOUSE!!! Man, this is cool! Everything in it is cool!!! Those bedrooms!!! That dining room! 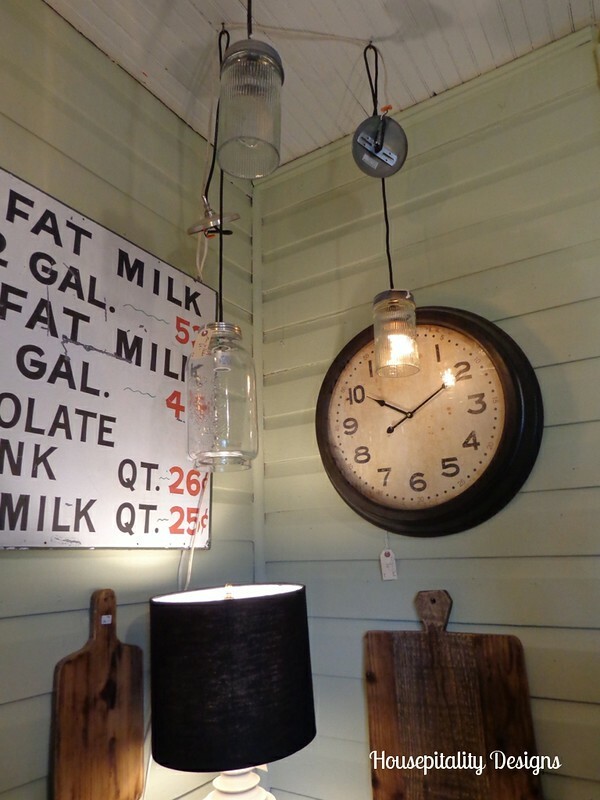 All those cool chests, clocks and lighting fixtures!!!!!!! I don’t think you could have pulled me out of there with the jaws of life! So many terrific details throughout! Sigh….I wish! I’m sorry you had to leave in such a hurry, but glad you at least got to see it up close and in person. I’m sure it was a rush! Wasn’t that design house amazing?! I’m attempting to restage my house and it falls FLAT in comparison! I’ll be furiously looking through the photos to capture the warmth it had. Lovely shoot, Shirley! And I agree, that market is definitely a two day venture. Oh you got fabulous shots of the Design House! I have a few of those but missed taking a bunch in there. Wow, so much fabulous stuff in there. 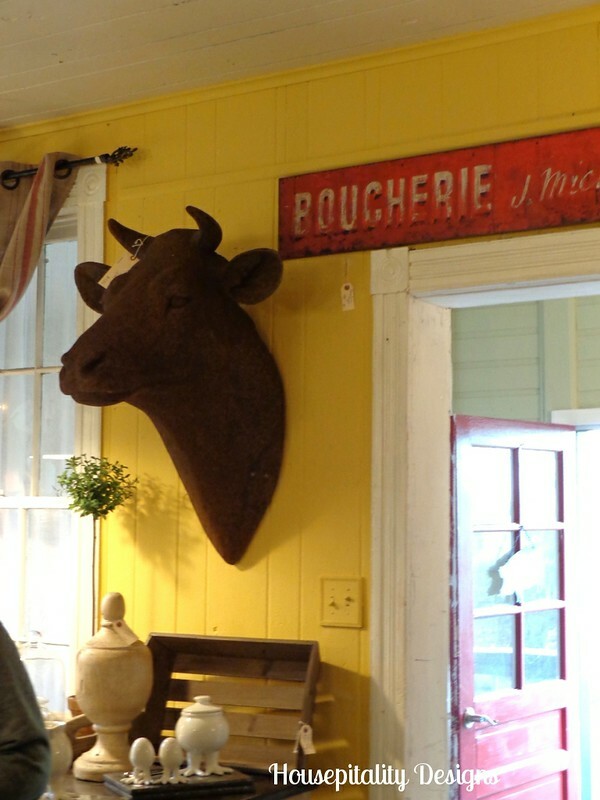 Never knew I needed a giant cow head until now – but I do! 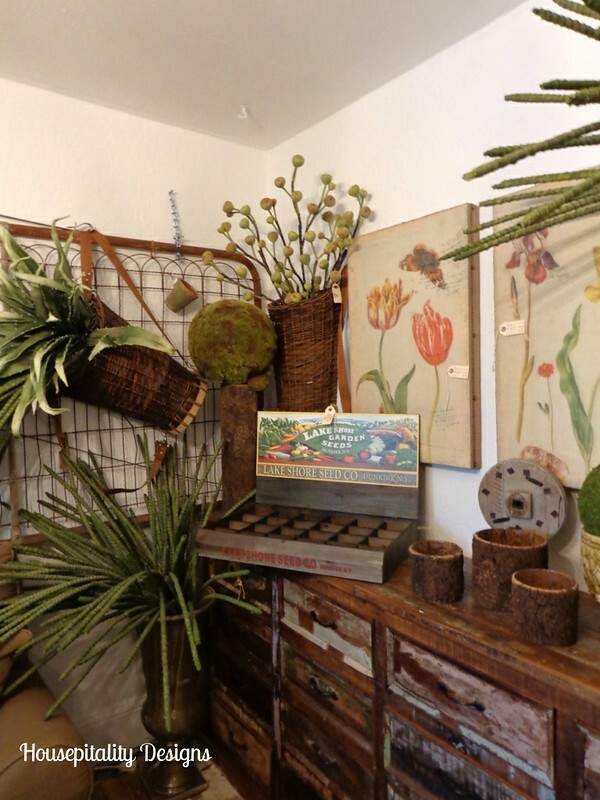 Lucky you – wish I could have been there – but just as well since I probably would have tried to buy everything in the place – with nowhere to put it once I got home! 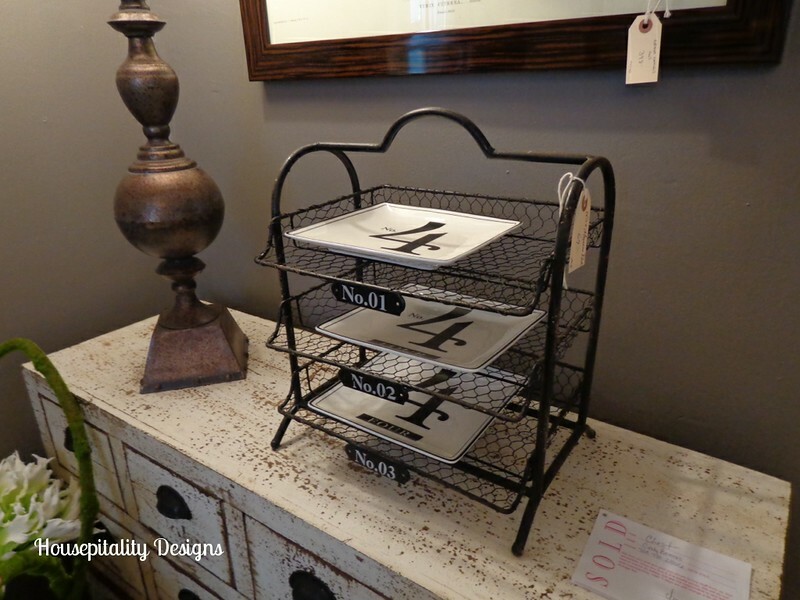 Kelly @ Eclectically Vintage’s recent post…How to Turn any Art into a TV Frame! What a treasure filled house! Thanks for taking us on the tour, that must have been so much fun. All of the unique chandys really caught my attention and the dish filled hutch on the front porch was delightful. I’m with you, love that Charleston clock! Oh my gosh! I must go to Lucketts next year! Thanks for taking me there this year with your wonderful photos! 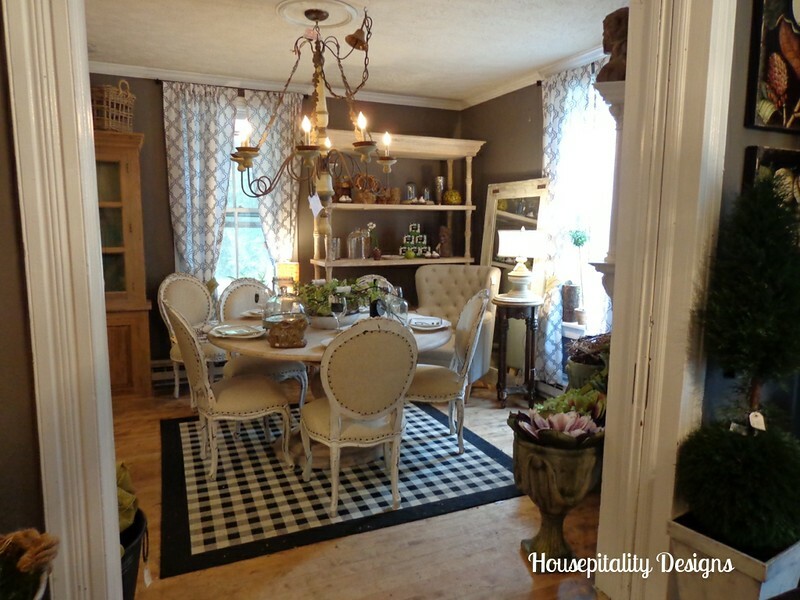 Do you anything about those black and white rugs that were on the porch and the dining room? I am on the hunt for one. 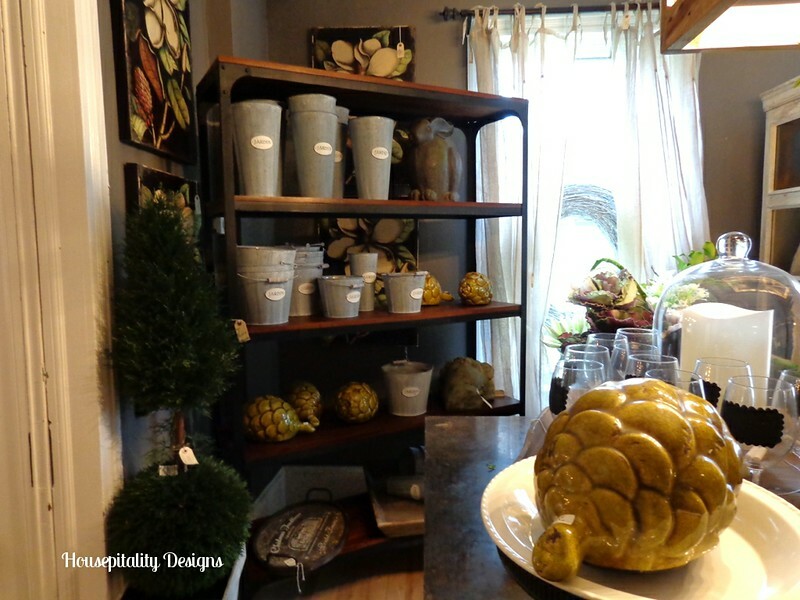 Jane @ Cottage at the Crossroads’s recent post…Amazon Gift Card Giveaway! Thanks so much for taking all these photos…I look forward to seeing this every year on a blog. I can’t ever go to see it in person so I’m always so thrilled when someone takes the time to take photos and upload them to their blog. Thanks! It was like being at Lucketts, Shirley. What great pictues. Don’t you love that design house!!! That black and white check rug or floor cloth is screaming my name!!! Thanks for sharing at TUTORIALS TIPS AND TIDBITS! Wow! Luckett’s looks like too much temptation/fun! I finally saw one other person asking where it is located and I also have no clue unless in High Point or nearby. Shirley, please share the info and if it is open to the trade only or not.